Skimo, or ski mountaineering racing, is exactly what it sounds like. Competitors race to be the first to the finish line using skis to travel up and down a mountainous course. It combines the innate challenges of climbing a mountain on skis with a format similar to a bike race. Events range from shorter races at ski resorts to long, unsupported backcountry races more akin are to ultra-marathons. Ski mountaineering races are considered to be as difficult as they are rewarding, combining the innate challenges of traveling up and down a mountain on skis with the thrill of competition. Like many endurance sports, the challenge is part of the appeal. Some ski mountaineering courses gain over a mile of elevation as winds and brutal winter temperatures batter competitors. While your legs will burn the entire time and you’ll probably be quite cold, you’ll be traversing beautiful terrain—quickly. Unlike cross country ski races, skimo offers the opportunity for sustained downhill skiing with many races ending with a top to bottom descent of a mountain. Skimo isn’t a new discipline – it draws crowds in Europe – but it’s just now gaining traction in the United States. It’s gaining popularity with endurance athletes, backcountry skiers and people with an affinity for suffering. Bikers and runners turn to skimo as a way to cross train; backcountry skiers with a competitive streak are discovering a new way of challenging themselves. While the races are usually won by the best runners, the sport’s appeal across disciplines is obvious. Skimo racing is a gear intensive sport—even by the standards of other alpine sports. Most competitive skimo racers use alpine touring setups that are specifically designed for skimo racing. Avalanche setups are required for many races and some of the longer races require competitors to have the capacity to bivouac for a certain amount of time. The backcountry doesn’t stop being the backcountry just because somebody at the finish line has a stopwatch. Many chose to skimp on warmth in the name of saving weight and wear racing suits. 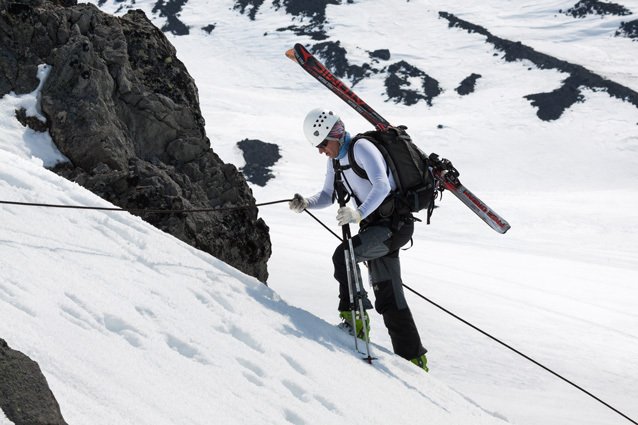 The good news is that skimo gear, while expensive, is lighter and more durable than ever. A wide variety of skills are required to compete in skimo. Besides being physically fit, participants should, obviously, be good skiers. Most of a racer’s time is spent skiing uphill, so people should be familiar with skinning. If one wants to be competitive they should also practice equipping and storing their skins quickly. If the race travels through avalanche terrain, you’ll need to have avalanche rescue skills, and if the race is unsupported you’ll need to know how to bivouac. For those interested in signing up for a race, the United States Ski Mountaineering Federation has a comprehensive list of skimo event dates on its website that span all distances and ability levels. Motivated and well-prepared athletes will find big challenges, sore legs and cold fingertips as well as bragging rights and the reward of taking on big challenges.